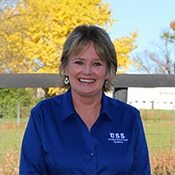 Karen Wilburn is in the accounting department at United Structural Systems Ltd., Inc. She has been employed with USS for almost 5 years. She has prior experience in banking and was an executive secretary for Bellsouth for over 15 years.Karen is a native Kentuckian who was located in Dayton, Ohio and relocated back to the Lexington area for the last 20 years. She has been married for 38 years and has two children - one who is attending Berea College majoring in Business and Accounting and a daughter who is a RN at Ephraim McDowell Hospital in Danville, Ky.